This is neither surprising nor, in a sense, unwarranted. Republicans won a landslide election last November and several deficit commissions finally presented their plans to the public in December. What is unwarranted, however, is the yellow line in the chart, the one that shows mentions of unemployment: it’s down to about 50, which means about two mentions per week in each newspaper. Got that? In each of our five biggest newspapers, in the entire newspaper, there are now two mentions of unemployment per week. So that’s that. Nobody cares anymore. 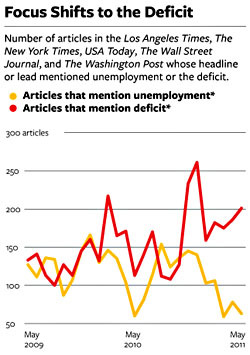 Politicians don’t talk about unemployment and the press doesn’t report about it. If you’re out of work — and 9% of the country still is — you’re on your own.